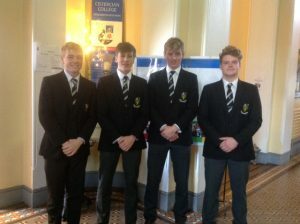 On Thursday the German Debating Team won the second round of the GDI national debating competition. The motion for the debate was that mobile phones are necessary in class. The CCR team was proposing the motion and the Ursuline Convent Thurles was opposing the motion. Lorcan McDonnell was team captain and was praised for his confidence and witty speeches. Cian Quinn was the first speaker and gained a lot of marks for his use of eye contact and for knowing his speech so well. Manus Heenan, our second speaker, brought a lot of creativity and humorous touches to the proceedings. Finally, Sean Clancy spoke with authority and very clear diction and excellent pronunciation and scored highly in that category. We congratulate the team and wish them well in the third round after Christmas.